Ashkenazi Jewish men and women are disproportionately more likely to carry hereditary genetic mutations that can markedly increase their lifetime risk of cancer. Most people are not aware, and most will not have a family history. Yodeah’s mission is to educate and facilitate cost-effective testing for hereditary cancer genetic mutations in the Jewish community. Yodeah’s goal is to save lives. Knowledge is power. Knowledge saves lives. 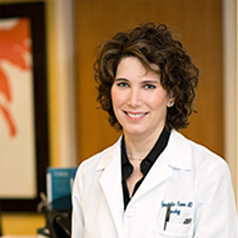 Dr. Etkin-Kramer is a board certified obstetrician/gynecologist in Miami Beach since 1993. She holds teaching positions at both FIU and University of Miami medical schools. She has a particular interest in breast and ovarian cancer risk assessment and has educated other health care providers on risk assessment, inclusive of genetic testing. As the scientific literature over the years has clearly shown that Ashkenazi Jews are more likely to inherit BRCA mutations regardless of family history, and most are unaware, she has been a vocal proponent of population based genetic testing in the Ashkenazi Jewish community. Stay in the know on the go. We love to share upcoming events and any important information regarding the Yodeah organization. © 2018 Yodeah. All rights reserved.